Marta Olazabal is a transdisciplinary scientist exploring the impacts of climate change and adaptation options in urban areas. Her research explores the ways urban areas can successfully adapt to climate change from a social and policy point of view. 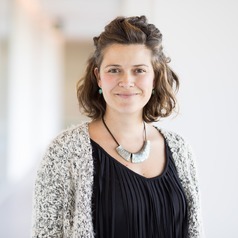 She has a background on Environmental Engineering (BSc, 2004 and a MSc, 2009, both from the School of Engineering of Bilbao, Spain) and a PhD (2015) in Land Economy from the University of Cambridge (UK). She is currently Head of the Adaptation Research Group at the Basque Centre for Climate Change, BC3 and leads the adaptation tracking-related research. She has been awarded with a Juan de la Cierva – Incorporación post-doctoral grant (2018-2020) (Spanish Ministry of Science, Innovation and Universities) and with an AXA Postdoctoral Fellowship grant (2018-2020).